Ian Henderson was born in the UK and studied at Banbury, Oxford and Swansea Colleges of Art. 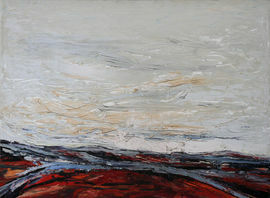 Before moving with his family to Australia in 1972 he exhibited regularly in group and solo exhibitions throughout the country. In 1966 he was awarded the fifth Gulbenkian Fellowship (in painting) at Keele University, then taught briefly at Leeds College of Art and Leeds School of Architecture before becoming artist in residence at Brock University in Ontario. He is a figurative painter working in several different media as well as being a successful portrait artist and has a particular interest in landscape, exploring what he refers to as 'placeness' (genius loci) as well as the social realist aspects in which the natural environment has been altered by human intervention. Henderson has become a well-established figure in the Australian art world, exhibiting extensively at major galleries as well as undertaking teaching and consultancy assignments; his work is represented in numerous public art collections. He lives and works in the Adelaide Hills area of South Australia. As a migrant to Australia Ian has continued to maintain his contacts overseas. He has a large number of paintings in Canada and in the UK. (Twenty-eight of Ian Henderson’s paintings are catalogued within the UK Public Catalogue Foundation, 'ArtUK'.) He is represented in many private and public collections in the UK, Canada, USA, Asia and Australia. Most recently he has written and illustrated five autobiographical essays that are catalogued within the National Library of Australia, the ACT Heritage Library and the State Library of New South Wales. In 2016 Ian and his wife completed a trip to northeast Thailand after which an exhibition of paintings and an essay describing the visit were produced. A recently completed portrait has been of Dr Mike Kelly, AM, MP, Federal Member for Eden-Monaro, and a selection of the artist’s paintings were shown at Altenburg & Co in Braidwood during June 2017.